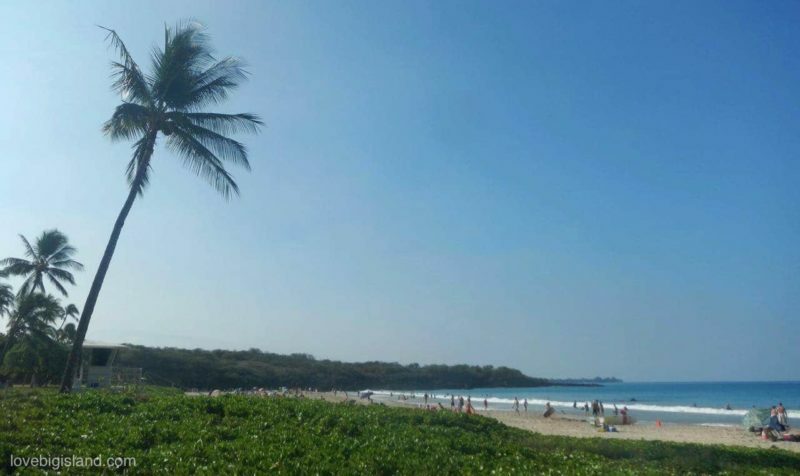 Hāpuna beach is 1/2 mile long, is almost always sunny, and has a continuous shore break that is great fun to play in for all ages. 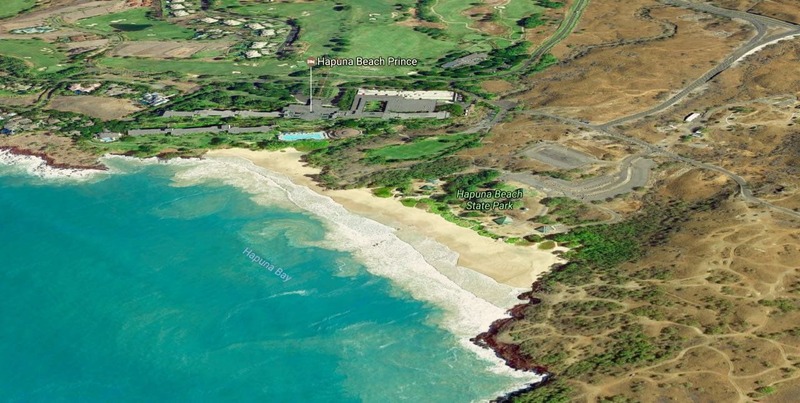 Hapuna only gets 10 inches of rain annually and the beach is lined by trees and a shaded picnic pavilion. There is also a professional lifeguard on duty year-round. All of this makes Hapuna a great family beach. Oh, and we almost forgot to mention: Hāpuna Beach regularly is voted among the ‘best beaches in the world’! There is little shelter from the sun at the long white sand beach at Hapuna bay. Snorkeling is good at Hāpuna beach if the water is calm. You can either go snorkel around the small cliff to the north of the beach or around the rocky point on the South of the beach. However, we recommend that you do not go alone as you will not be in sight of the lifeguards. The drawback of all this good news is that this beach can become very crowded. Make sure to arrive early to find a good parking spot and a shaded place on the beach. If you want to avoid crowds, you can also try Waialea beach (also know as beach 69) just south of Hāpuna. You can buy food and drinks or rent beach gear at the “The Three Frogs Cafe” (yelp) located on the park premises. This cafe has a wide selection of tasty lunch offerings and also offers beach rentals of boogie boards, beach chairs and umbrellas, and snorkeling gear. Three Frogs Cafe is open daily from 10am-4pm, and you can find them a short walk from the beach at the northern side of the parking lot. Hāpuna Beach lies North of Kailua Kona, around mile marker 70 of Hwy 19. Turn makai (towards the ocean) at the sign for Hāpuna Beach State Park and continue for 1/4 mile to the large parking lot. Do not leave valuables in your car! Visitors to the Big Island now pay a small ($5 in 2018) parking fee to help maintain the park. Parking is free for locals. You can find up-to-date information about ongoing improvements, beach closures, etc., at the Hawaii.gov website. If you don’t like staying on the beach as much as you are into hiking and discovering some of the more pristine shorelines of Hawaii, read on! Hāpuna is part of the Ala Kahakai coastal trail, which follows the coastline over ancient trails and roads. Following it will lead you by some of the most pristine shoreline remaining in Hawaiʻi, as well as numerous anchialine ponds (a landlocked body of water with a subterranean connection to the ocean). Note that the trail is poorly signed and maintained. 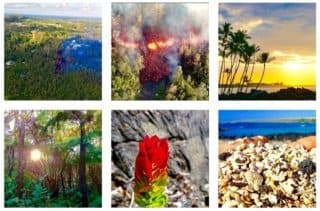 If you are interested in following this trail, we suggest you have a look at the official DLNR resource: Ala Kahakai Trail (Kawaihae-Anaehoomalu).